So much yarn, so little time. : Competition and Giveaway! Remember the Homecrafts competition I was invited to enter? You can see the entries here. We were each sent a box of random yarns and asked to work our magic. I asked if I could use other yarns as well (no) and if I could use stuffing and wire (yes)...and as you know, came up with the two meerkats. They're one-of-a-kind because the yarns are so different from my usual. Anyway, long story short wanna know who won? I want to share the love! 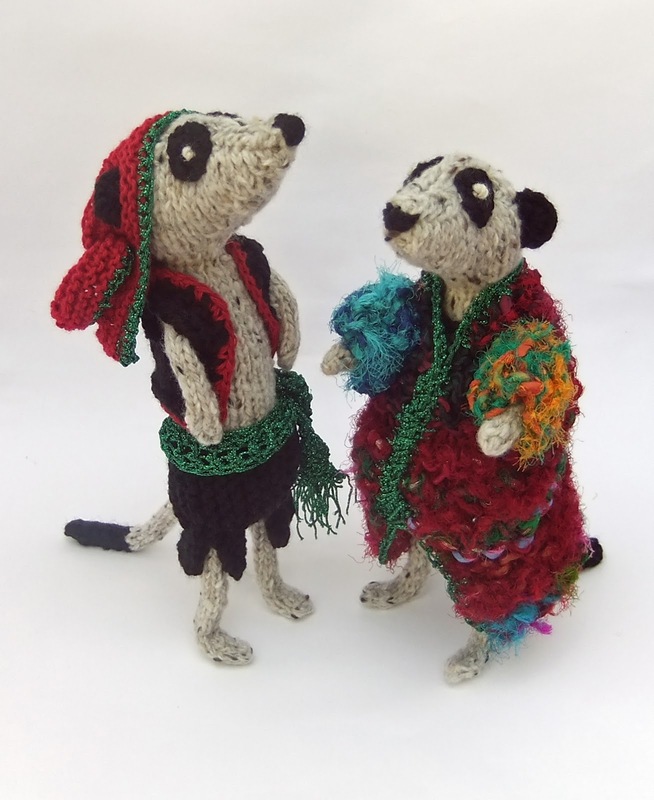 I'm offering one lucky winner the choice of either of these very special niftyknits meerkats. To help you decide, you can see more pictures of them here. Two ways. I'll put your name in the virtual hat for each entry, so if you choose to use both ways of entering, you've got two chances! #1 leave a comment below saying which meerkat you'd like *and* a way to contact you. Don't forget, if your blogger profile is set to private I will NOT be able to find you there. #2 Go to any of my shops Folksy or Etsy or Zibbet , select your favourite item and come back here and leave the link. Again, please make sure you leave a way to contact you. Good luck! I'll choose the winner randomly on Sunday evening (UK time) 12th August. Open to all, international, as always. Thank you once again, Homecrafts! Thanks everyone - I'll announce the winner tomorrow. They are both great, so that is really tough, but I say the one on the right. It was just as difficult to pick a favorite from your shop, I love the Beefeater and the Guardsman! Well done on your win. Much deserved. WHEN I win, I'd like the pirate meerkat please!!! And you know it's virtually impossible to pick a favourite thing in your shop. But I think today, without thinking too hard (cos I'd never be able to choose then) I'll go for this biker meerkat :-) Not least because I appreciate how dreadful knitting black is! Congratulations! Well done, a well -deserved win. Would love to win the little meerkat in his glorious coat, please. Congrats on winning Heather! Your work is wonderful. My favorite (very difficult choice BTW!) is Joseph Kat. Thanks for sharing one of your winning designs with us! OK, I can't pick just one favorite from your shop! Can I list three please? I like http://www.zibbet.com/NiftyKnits/artwork?artworkId=845870 because it reminds me of the 2012 Olympics in London and the queen's appearance with James Bond! I like http://www.zibbet.com/NiftyKnits/artwork?artworkId=474841 because my dad is an avid fisherman and we share a shop together called Think Like a Fish! Finally, I like http://www.zibbet.com/NiftyKnits/artwork?artworkId=744486 because I've just had to give my kitties up for adoption and I miss them terribly! Congratulations Niftyknits; knew you would! I've always loved your Star Trek meerkats, but if I have to pick just one it definitely has to be Captain Picard with his teacup. Too cute! Heather, they're both incredible, but I *love* the little piratey fella on the left! You know how to get hold of me, and mini-meerkat me too! I say the one on the left, because the expression reminds me of my daughter's imitation of a meerkat when describing certain of her, ahem, colleagues. Congratulations on your win, what a cool competition! My Mum loves Meerkats (I think those adverts started it....), she would love yours! I think the pirate is my favourite, although the coat for Joseph is very cool, well done! I realy love the Pirate and my OH really loves the Coat of Many Colours, so either way if we won one, it would be much loved and cherished at our house! Hi Heather!! Love what you did with the challenge! As always your little kats are just too cute! If I won, I think I would like the Joseph Kat. Super adorable! Thanks for the opportunity! I like the little one with the coat. the pale one with black ears.. I love all of them but this one is gorgeous! WTG!!!! That's so awesome!!!! I'm not surprised though, your meerkats are EPIC!! I would choose the pirate meerkat!! He's amazing and adorable! It's reallllllly hard deciding which is my fav but I have to say it's Han Solo! I love the taller one on the left! http://www.zibbet.com/NiftyKnits/artwork?artworkId=551849 My favorite listing is the shepherds, and I would love to win Joseph Kat with the cool coat. I love the left one with his cool red head cover! Love your work! And congrats to the win! Congrats! I just love the pirate meerkat - awesome work! I have been having a great time -- reading your old blogs and looking at all your fun little critters in their amazing outfits. Congrats on winning the contest. How could you not?... especially with that little pirate guy. I love the pirate and the little guy with a pumpkin. Oh heck, I love them all! Well done, they are both lovely and truly deserved to win. My daughter loves meerkats and she likes the pirate one best. I love them all, but really like the pirate on the left. But it was difficult to choose just one. Thanks everyone, giveaway now closed, no further comments will be published. I'll announce the winner tomorrow.